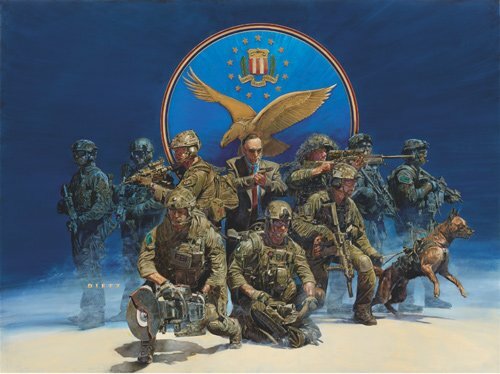 Image Size: 25" x 18.5"
Overall Size: 31" x 25"
This painting, by Jim Dietz, was commissioned in 2010 by former Hostage Rescue Team member Scott Warren. The painting contains five important elements that Scott believes symbolize the HRT. The blue background fades into a blue mist on the outer edges of the painting. The mist partially conceals and darkens the image of four operators. Those operators represent the HRT members as they work in the background as quiet professionals for our great nation. The HRT Seal is centered in the painting to signify the importance and foundation of the HRT mission... To Save Lives. The American Bald Eagle, breaking a chain being held in its talons, symbolizes the freedom that the team brings to the citizens it serves. The five operators in the forefront embody the HRT in action. An assaulter, with his battle rifle, scanning for threats is ready to advance. A sniper, in his ghillie suit, is patiently preparing to deliver a precision shot. A breacher, holding his cut saw, is staged to move forward to provide an entrance into a crisis site. A team medic opens his pack preparing to give vital medical aid. A dog handler, restraining his K9 that is eager to be unleashed. At the heart of the painting is a "Street Agent" with his handgun at the high ready position. The image of the "Street Agent" emphasizes the fact that all members of the FBI's HRT are first and foremost FBI agents and law enforcement professionals. Each HRT member is privileged to perform in a unique role as operators on the United States' only law enforcement counter terrorism team. The painting was presented to the HRT upon Scott's retirement. It is his belief that the core values of the FBI, fidelity, bravery and integrity, are the cornerstones that the HRT stands on. Those core values ensure the HRT's long and continued strong tradition of professionalism excellence, and bravery.